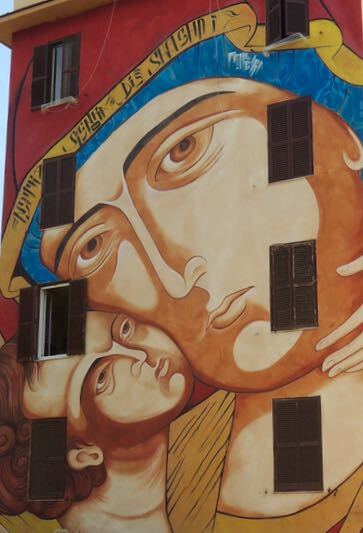 "The Italian artist Mr. Klevra (Rome, 1978), a Christian Iconography and Byzantine Painting enthusiast, gifted the district of Tor Marancia with one of his Madonnas. Saint Mary of Shanghai, fictional patron saint of the neighbourhood, brings us back to a distant past when Tor Marancia was a village: little houses with packed dirt floors, shared bathrooms and tiny vegetable gardens. At that time this suburb was nicknamed 'Shanghai' because of the frequent flooding, daily bloodsheds and extreme poverty." 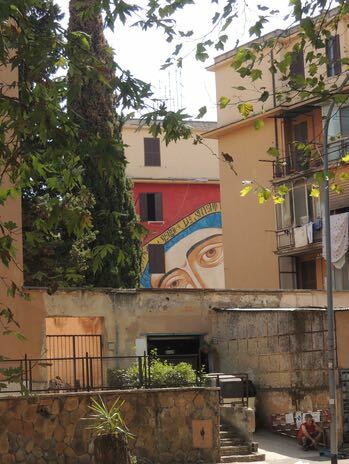 I love the photo of Mary peeking out from behind the urban landscape even more than I love the full icon!